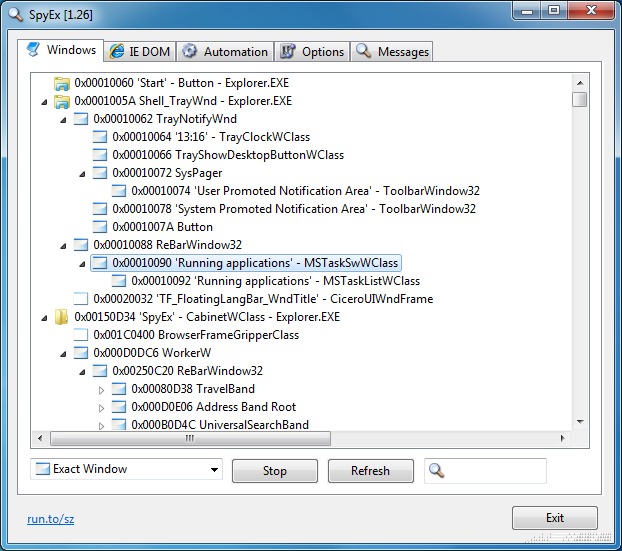 SpyEx is a portable tool for developers which can provide plenty of low-level information about the windows on your PC. This starts, for example, just by listing them under the Windows tab. You'll see top level windows, controls, hidden windows and more. It's a lengthy list, but a search box may help you to zoom in on the precise window you need. 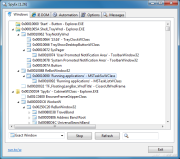 The program can also reveal the Windows messages for any given window. This is easy enough to use - just click "Spy" - but we'd treat it with care, at least initially. When we tried to spy on Outlook messages SpyEx was displaying so many that we had problems doing anything else, or even making it stop (there is a Stop button, but it was unresponsive for a while). The Options tab can configure the program to display only particular messages, though, such as only those relating to listboxes or buttons, which may well help. And, slightly oddly, there's even a tab to display the DOM of any HTML page currently open in Internet Explorer. Just click "IE DOM" and browse to whatever element that interests you. You're also supposed to be able to highlight every object in an HTML page, although this didn't always work for us. This handy compact tool provides an easy way to browse the windows on your PC and spy on their messages. It's not overly powerful, but being portable does at least mean you can use it for troubleshooting on other PCs with the minimum of hassle.